It’s just a standard trip to your dentist when they give you the bad news: you have a cavity. “Great,” you think to yourself, “Now I have to get this ugly gray filling that everyone will be able to see!” In the past, that would have been true, but now, tooth-colored fillings in Oklahoma City give patients the option to fix their cavities without changing the appearance of their teeth. It offers the best of both worlds when it comes to restorative and cosmetic dentistry, and they only take one appointment to get as well! For decades, dentists used a substance called amalgam to repair minor cavities, which is made of a combination of metals. This made these fillings extremely strong and durable, but it also gave them a dark gray color that didn’t exactly blend into someone’s smile. Thankfully, modern-day dentists are now able to offer the same quality of care using fillings made of a composite resin. This is a mixture of plastic and microscopic glass particles, and the best part about it is that it can be shaded to match any patient’s enamel color. Once in place, most patients aren’t really able to tell where their real tooth ends and their filling begins! Seamless Appearance: Absolutely everyone can tell if someone has an old amalgam filling, but the opposite is true with composite fillings. Thanks to the color matching, the only people who will know you have one will be you and your dentist! 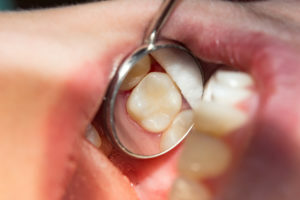 More Conservative: Traditional fillings require quite a bit of enamel to be removed in order to be placed, but thanks to the malleable nature of composite resin, more of a tooth can be preserved while fixing it with a tooth-colored filling. This helps a tooth maintain its natural strength, ensuring it will look and function like normal for many years to come. No Sensitivity: It’s normal for a tooth to become sensitive to hot and cold temperatures after getting an amalgam filling, but because tooth-colored fillings are metal-free, patients are able to enjoy their hot coffee and ice cream without experiencing any dental pain. Tooth-colored fillings represent the perfect marriage between cosmetic and restorative dentistry, providing a solution that looks beautiful and fully restores a tooth’s function at the same time. In today’s world of social media and the internet, your image matters more than ever, and the last thing you want to have to worry about is potential employers, clients, or even dates noticing your dental work. With a tooth-colored filling, you’ll never have to! If you have a cavity or an old amalgam filling that is causing you trouble, be sure to ask your dentist in Oklahoma City about tooth-colored fillings. If they think one would be right for your smile, it will only take a single quick appointment to get, and you can look forward to it lasting for decades to come. Dr. Michael Kirk is a family, restorative, and cosmetic dentist based in Oklahoma City who practices at Grand Dental Studio. Over the years, he has become a trusted local expert when it comes to beautifully repairing the teeth. With over 25 years of experience, he’s ready to provide everything his patients need to enjoy healthy and flawless smiles for a lifetime to come. To learn more about tooth-colored fillings or any other treatment that could enhance your appearance, he can be contacted through his website. by: Dr. Michael Kirk at March 26, 2019 .